Messaging apps and chat apps such as Facebook Messenger, Re:amaze, and Intercom are now found on almost all modern eCommerce storefronts. And there’s a myriad of other variations available to merchants through various platforms. These messaging apps have fundamentally changed how merchants must think about crafting and optimizing the shopping experience even before customers make landfall on the storefront. Merchants certainly have a lot to think about already. Everything from the best eCommerce platform to use to website design, from SEO to checkout optimization, and from advertising to customer service are fair game to those who want to succeed in this highly lucrative and competitive industry. However, since the dawn of online commerce the conundrum of the abandoned cart is still one of the toughest problems to solve for in every competent merchant’s mind. But with the rise of conversational commerce, the process of not only preventing shopping cart abandonment but also recovering abandoned shopping carts has never been more revolutionary. Shopping cart recovery is the process eCommerce businesses adopt in order to bring abandoned shoppers back complete a purchase. In fact, we’ve all been a “cart abandoner” at some point in our existence as an online shopper. Cart abandonment occurs for a variety of reasons: unclear shipping policies or untrustworthy site design are within a merchant’s control, and other reasons such as window shopping are more or less out of a merchant’s control. Regardless of reasoning, shoppers that abandon without making a purchase account for up to 70% — 80% (depending on devices used) of all shoppers on average. The good news is, most reasons for shopping cart abandonment can be prevented with better checkout optimizations, design changes, and simply being more cognizant of how copy and content impact shopper experiences. 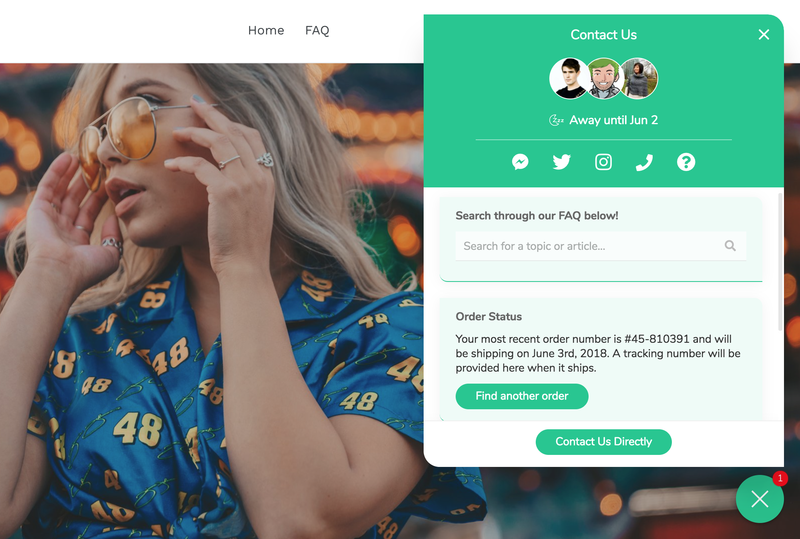 In fact, with checkout optimization changes such as making the process shorter, implementing more payment options, adding proactive messages to encourage checkout completion, or even auto-populating known shipping addresses can increase conversion rates by up to 35% for some stores. Industry-wide, this can already account for up to $260 billion in additional revenue. Email re-marketing. It’s the bread and butter of eCommerce cart recovery. And it’s relatively easy to understand given that it’s a simple formula of input and output. 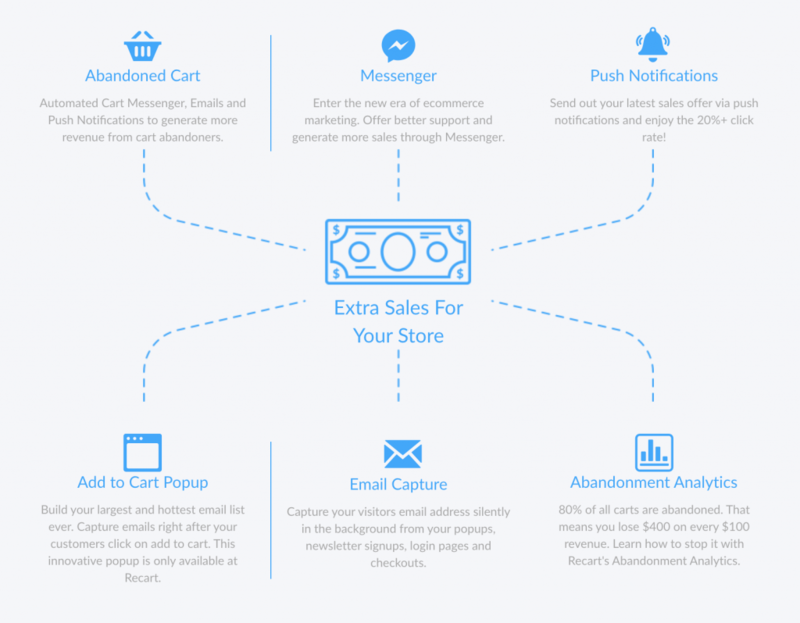 Email cart and site abandoners in organized cadence via segmentation and targeting while keeping track of total order values, cart contents, shopper seriousness, etc. According to an internal case study by email marketing platform, Klaviyo, “customers in our data set generated more than $60 million in sales directly from their abandoned cart emails in our three-month analysis window”. That is certainly nothing to scoff at. 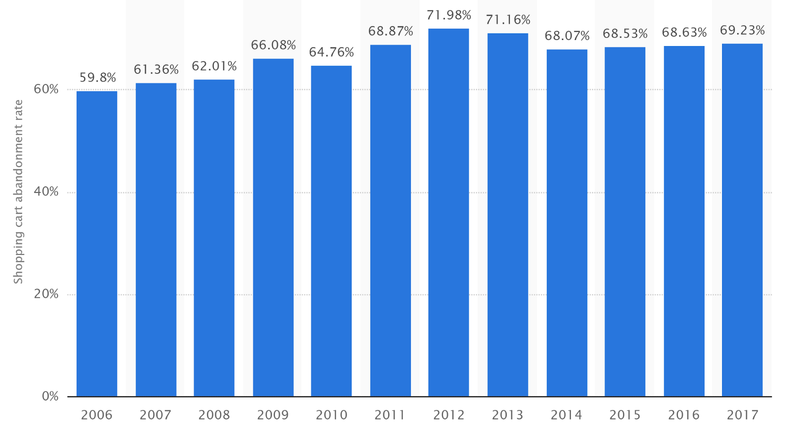 The efficiency of email re-marketing in the context of cart recovery certainly has its limitations, however, even if it is tried, true, and an important piece of the puzzle. After all, you’re fighting for the attention of shoppers that were already hesitant about purchasing from you due to tangible reasons. And while open rates, click-through rates, and revenue per recipient are important, they don’t necessarily answer the the most important question: how can you ensure recovered customers actually turn into recovered revenue? This is where reactive traditional email re-marketing falls a bit short. Customers visit the store → They provide their name and email somehow→ They abandon → You kickstart re-marketing emails (REACTIVE)→ Customers might reply → Which might lead to customer questions → Which might lead to a potential sale. It’s one sided and doesn’t provide nearly enough feedback in order to increase its efficiency. Email re-marketing is solely focused on the recovery rate as a marker for effectiveness but merely emailing and seeing clicks from frustrated and hesitant customers is not enough. The foundation of conversational commerce is deeply rooted in one core principle — that there’s a need for eCommerce businesses of all shapes and sizes to create a virtuous cycle of communication with customers proactively so good relationships can generate more recurring value for a business’s bottom line. In that sense, good communications is the foundation of relationship building. This virtuous cycle of communication is currently driven by messaging apps, which consumers are becoming increasingly dependent on for all sorts of conversational needs. 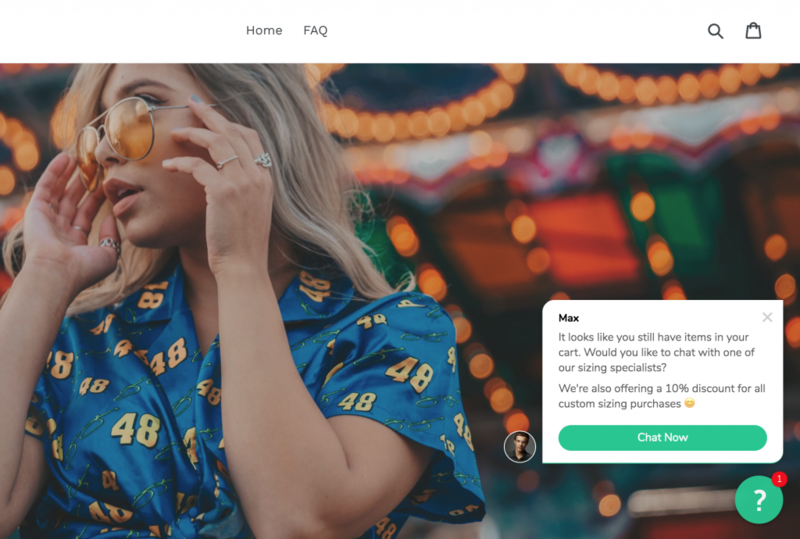 The preference to use chat to find and select products and services, and to complete the payment process, all without having to call, email, or even visit a brand’s website is becoming the new normal. Everything can happen within messaging apps. Source: Recart.com’s Messenger-powered proactive engagement. 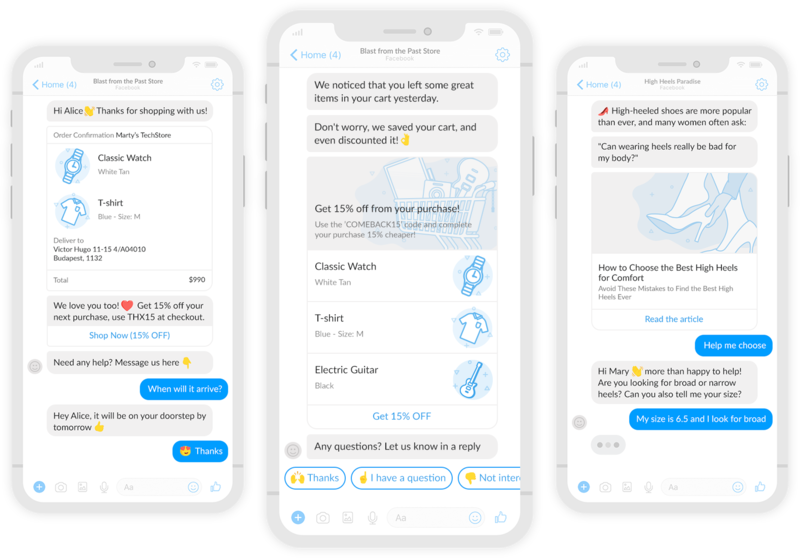 Businesses are keeping customers in the loop about products, discounts, and even new releases beyond just cart recovery after interacting with them through a dedicated Facebook Messenger widget installed on the storefront. Customers visit the store → They have some questions and concerns → They message the business using a modern messaging platform like Messenger → A warm lead is generated with contact information → A relationship is established → Which leads to better and more relevant re-marketing opportunities if the customer does not purchase. This holistic approach to revenue engagement and recovery helps businesses look beyond “what has already happened and trying to recover from it” to “what has yet to happen” and optimizing for conversions. Source: Recart.com’s re-marketing and cart recovery ecosystem. Take this next example from Re:amaze, our helpdesk and proactive customer messaging platform. Businesses leverage powerful triggers mapped to eCommerce platform data to engage customers voluntarily in order to start the relationship off on the right foot. When customers respond, customer service agents adopt conversational commerce’s neatest trick — real-time messaging, to support customers and turn cold shoppers to warm leads and highly receptive recipients of re-marketed content. Customers visit the store → Business owners utilize a modern messaging platform’s proactive features to approach customers when certain triggers and conditions are met → Conversations and relationships are established by support and sales teams → Which creates very warm leads with clear intents to buy → Which leads to sales more effectively → And in cases where they don’t purchase, these leads are already warm and extremely likely to respond to re-marketing campaigns. In the Recart and Re:amaze scenarios, customer service teams play a pivotal role in how effective re-marketing campaigns can be during conversions. Modern re-marketing and cart recovery augments traditional channels such as email through proactive messaging and proactive customer service, effectively turning every conversation into a revenue opportunity. Source: Re:amaze Chat giving customers more freedom to communicate. eCommerce business owners are more empowered than ever before. The amount of technologies available to help launch, strategize, and support their businesses means business owners has a responsibility to evaluate how each tool can potentially impact their customers’ experiences and ultimately, their revenue metrics. And because customers can literally come from anywhere in the world, it’s crucial to optimize every conversational channel and every revenue channel. Adopting a coupled system of proactive customer support with cart abandonment strategies deeply rooted in conversational commerce means fewer customers falling through the cracks due to missed interactions and more valuable relationship building that can have far reaching revenue impacts years down the road. Tried and true methods of customer engagement such as email shouldn’t just be replaced by shinier new tools but be reimagined and reconfigured to become a part of your revenue operations. Taking a full stack mindset to designing how, when, and where to reach customers will ensure more revenue efficiency regardless of what you’re selling online. 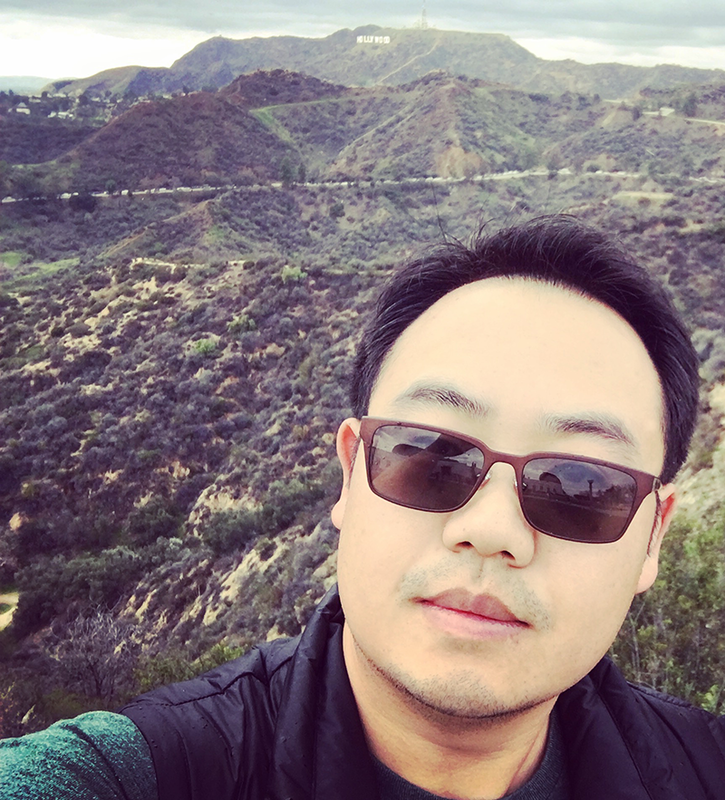 David Feng is the Co-Founder and Head of Product at Re:amaze, a helpdesk, live chat, and customer messaging platform designed for eCommerce businesses. Currently, over 2,000 eCommerce businesses of all shapes and sizes depend on Re:amaze to build better relationships with customers through amazing customer support.